Aaron Jackson is a wildlife biologist for the Confederated Tribes of the Umatilla. 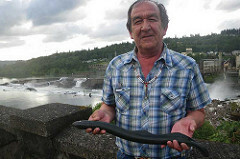 He had never seen a lamprey in the Umatilla River. Lamprey are an important cultural icon for the tribes as a food and for use in ceremonies. In rivers such as the Umatilla, they have been absent for many years. and the tribes, including transporting around dams, there has been a big improvement in their numbers. Counters have seen more than 2600 migrating this spring. This is still too small a population to harvest. Lamprey spend up to seven years as larvae and then migrate to the sea for about three years, returning to spawn in streams. Lamprey used to be considered a “trash fish” and were destroyed in the ‘60s and ‘70’s through the use of pesticides to make way for more desirable species. The 25 year project is bringing results. Aaron expressed frustration that funding is seeing a downturn in 2019 BPA budget, but hope they will be able to work on other projects such as rearing lamprey in hatcheries as salmon currently are raised. Robert Paine studied Pacific Northwest Intertidal species in the 1960s and identified what he called keystone species. All wildlife is important, including common animals, but certain species have a greater impact on their habitat; if they suffer so does the habitat. Plants can be keystone species as well, such as kelp forests. They provide shelter for otters and nutrient-rich food for their prey. Removing just one keystone species can have a drastic impact on an ecology. Wolves are an excellent example of a keystone species. Among the animals that are returning or could return are condors, wolverines, and sea otters. The health of a habitat is beneficial to us all. 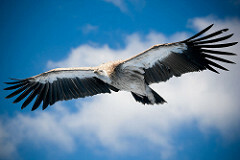 Bird watching, fishing, and ecotourism are good for the economy, especially in rural areas. But in the end, it comes down to our values. I’d like to introduce myself. I’m Shannon Perry, and I have the pleasure of writing the blog for the Rowena Wildlife Clinic. I am a retired teacher from Hood River who has taken up work at the clinic now that I have more time. I look forward to this new experience and hearing back from you. Many thanks to Tracie for her service to RWC! This entry was posted in Uncategorized and tagged keystone species, Lamprey, native on June 17, 2018 by RWCBlogger.